ZIMBABWE – State Security minister Kembo Mohadi has said President Robert Mugabe will live for a long time and God will not “take him” until people in Zanu PF are organised. Mohadi, the guest speaker at the Zanu PF Midlands provincial co-ordinating committee meeting at the weekend, made the remarks after he castigated some ruling party members for fanning factionalism through jostling for top positions. “There are some today, who are saying (to Mugabe) accept old age and we want to take over,” he said. Mohadi repeated the Zanu PF mantra that Mugabe was the only centre of power in the party, before blasting party hawks, whom he accused of bragging about themselves at the expense of the party. 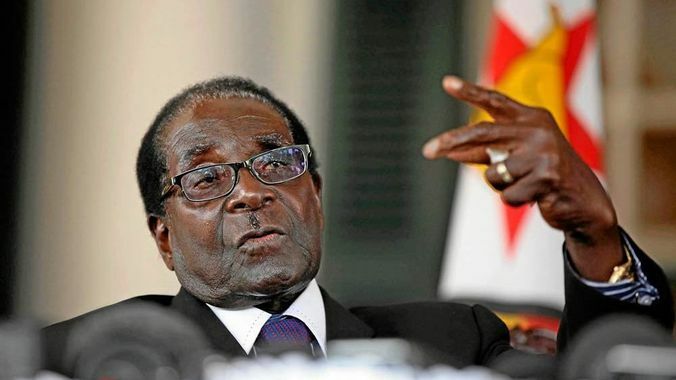 The Security minister was full of praise for Mugabe, saying despite being 91 years old, he was full of experience and wisdom, which could not be matched by anyone in the party. “Our leader (Mugabe) has the people at heart and he is one of the poorest leaders in the world because he doesn’t worship material gains like some of you,” Mohadi fumed. He said corruption was tearing the country apart and urged people to emulate Mugabe. Zanu PF critics blame Mugabe and his party for the country’s economic decline. Despite Mohadi claiming Mugabe was poor, critics say the First Family lives a luxurious life, while the majority of Zimbabweans were suffering. Mohadi also took a swipe at some undisciplined youths within Zanu PF, whom he said lacked respect for their senior leaders. He said party leaders welcomed criticism as long as it was constructive. “President Mugabe is the rallying point in the party and all of us will have our time at the right time,” Mohadi said. Prior to Mohadi’s address, there were skirmishes as party youths booed Labour deputy minister and Zanu PF provincial secretary for administration Tapiwa Matangaidze, accusing him of belonging to the Generation 40 (G40) faction. The G40 group is believed to be led by Local Government minister Saviour Kasukuwere, Higher Education minister Jonathan Moyo and Indigenisation minister Patrick Zhuwao and is reportedly keen on blocking Vice-President Emmerson Mnangagwa from succeeding Mugabe. Kasukuwere has persistently rejected the existence of G40, while Moyo says it was a demographic reality.